New Release: Ice and Embers: Steampunk Snow Queen now available! It's release day for Ice and Embers! The novel went live a little early so now we can all cool down from this summer heat by pretending we're at the 1814 Frost Fair with Elyse, Kai, John, and the troupe at the Ice House Theater! The eBook of this novel is currently available as part of the Regency Rendezvous collection. The paperback, which will feature the below cover, is coming soon! When actress Elyse McKenna fell in love with Lord John Waldegrave, she was prepared to keep their liaison secret. What she wasn’t ready for was how her newfound love would rock her relationship with her dearest friend, Doctor Kai Murray. With the 1814 London Frost Fair in full swing, Elyse and her troupe at the Ice House Theatre find themselves at the heart of the excitement on the frozen Thames. But when an exotic ship captain, whose vessel is trapped in the ice, turns her attention to Kai, everything Elyse thought she knew about her feelings for her old friend gets flipped upside down. While the Ice House Theatre’s production of A Midwinter Night’s Dream thrills the London crowd, Elyse’s life begins to take on a distinctly Shakespearean turn. Elyse must find a way to discover the truth about the captain, Kai, John, and her own feelings if she hopes to escape the Thames with her heart intact. 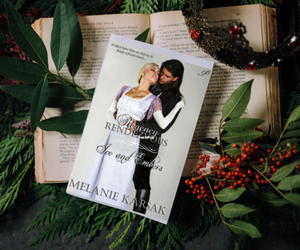 Ice and Embers is a retelling of the classic Snow Queen fairy tale set in Regency London. I exhaled deeply. My breath, heated by the passion of the kiss, slipped from between my lips and turned into a hazy cloud in the freezing winter air. “Elyse,” John whispered, taking the pale blonde hair at the back of my neck into a gentle handful. He pulled me toward him again. His other hand, located on my lower back, gently pressed my hips toward his. I fell into the crush of his body and felt his warmth and want. I didn’t pull away. This was everything I’d ever dreamed of. The idea that a man of his station could fall in love with a girl like me was impossible. But still, here I was. “Elyse, five minutes,” Marve, the manager of our acting troupe, shouted. When he spotted us, however, a blush crept up on his cheeks, and he disappeared backstage once more. “I need to start carrying a hand mirror,” I said with a soft smile. “In my arms?” I replied, mirroring his playful expression. I smiled and looked deeply into his honey-colored eyes. My heart beat so hard I felt like it was going to burst. If I wasn’t careful, my passion for John was going to make me swoon. Kai would say I was being ridiculous, that swooning was a fashion, not a physical malady. At the front of the theatre, I heard the sounds of flutes and horns. The play was starting. “I need to go,” I whispered. “My apologies,” John called to Marve then turned to me. “See you soon, Titania,” he said, kissing the back of my hand. He then turned and headed toward the front of the house, such as it was, situated on the frozen Thames. I sighed heavily, gathered up the long skirts of my costume, and headed for the stairs. Forgetting myself, my head lost in love, I nearly slipped on the ice. “Fool,” I cursed myself, giggling. I steadied myself against the side of the makeshift theatre. When I reached the top of the steps, I paused and looked out at the ice. For the first time in many years, the Thames had frozen solid. The Frost Fair had popped up on the ice practically overnight. Thus far, our company from the Struthers Theatre, which we’d renamed the Ice House Theatre in homage to our temporary venue, was the only one to take advantage of the limited opportunity. I looked out across the frozen Thames. Glimmering hues of amber, pomegranate red, and deep purple streaked the sky as the sun dipped below the horizon. The colors cast an opalescent hue on the frozen river. I exhaled happily. I had fallen in love with a fine gentleman and he with me. Our amour was not without complications, but it wasn’t uncommon for a man of good station to fall in love with an actress. Other lords had taken singers or ladies of the stage as wives. Our relationship would need to be discreet until he got his family’s approval. I wouldn’t want to sully his reputation in any way. But I was a skilled ballerina and actress, had good manners, and was attractive. That counted for something, didn’t it? Even if I didn’t have good breeding, that didn’t mean I couldn’t become Lady Waldegrave. “Elyse,” Marve whispered, his voice a sharp hiss. Master Shakespeare called. I smiled, wondering what the Bard would think of our frozen rendition of his work, which we’d playfully titled A Midwinter Night’s Dream.